Comforting Carbs and Cool Chicks! Ladies let's enjoy a delicious brunch! Protected content is voted best pancakes in the city! 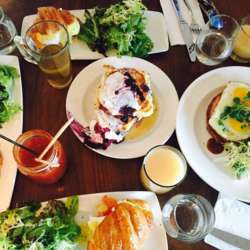 They have amazing scones and great brunch items. Unfortunately though, as many of our best brunch spots in the city, they do not accept reservations! Further they will only seat when the whole group has arrived. So the plan of attack is we will meet at 10:00 and put our names on the list. Please please please be on time. If you know that you are not a morning person and arriving anywhere on a Sunday before noon is a challenge, this may not be the best activity for you. We will accept the seating for the people who are present when our names are called. If you arrive after they have seated us, you will likely need to place your name on the list and wait to be seated at a nearby table. I don't want to see that happen so please set your alarms.